MBBS, MS (PGIMER, Chandigarh), MBA, MHA. Chitradurga, Karnataka, 577 501, India. Editor, Publisher & Printer, ENT Update, Monthly magazine. 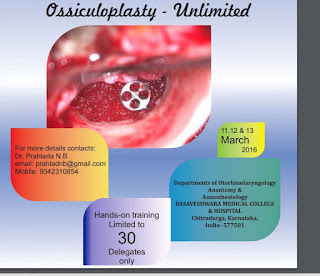 Professor and HOD, Dept of ENT - Head & Neck Surgery, Basaveshwara Medical College & Hospital, Chitradurga, Karnataka. Visiting Senior Consultant, Head & Neck and Skull Base Surgery, BGS Global Hospital, Bangalore. Visiting Senior Consultant, Karnataka ENT Hospital & Research Center. Director, The Karnataka Advanced Speech & Hearing Institute (The KASHI). District Commandant, Home Guards, Chitradurga District, Karnataka State. Managing Director, Champions Training Academy. Secretary, "Ears for India". A NGO project to help poor patients with Ear Problems Across the world. “Thulasi Charitable Medical Foundation (R)”. A Charitable organization.